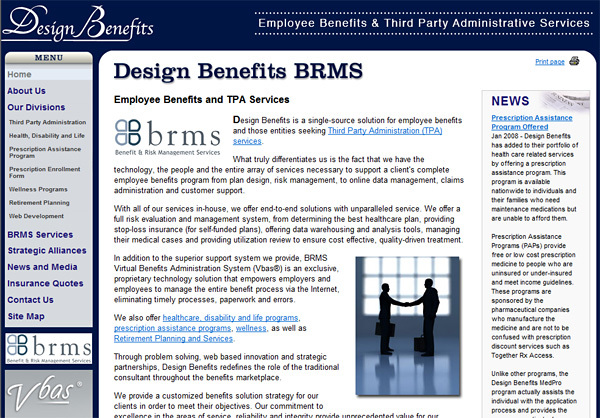 Home Portfolio Project: Design Benefits, Inc.
Design Benefits is a company that offers employee benefits and Third Party Administration (TPA) services. They also offer healthcare, disability and life programs, as well as Retirement Planning and Services. The company wanted us to build them a web site that would showcase their customized benefits solution strategies, as well as project their professional corporate image. We choose a dark blue background, with a faded menu on the left side for the navigation. We also ensured that this web site is fully Web Standards compliant, as well as contains clean, fast-loading pages. We built the entire web site in strict XHTML 1.0, ASP.NET 2.0, and utilized CSS for layout. In addition, the entire site conforms to U.S. Section 508 accessibility guidelines. It contains a fixed layout, centered, and all pages are automatically 'printer-friendly' through the use of CSS technology.